Release Date:06/03/2016;Notes:Double vinyl LP pressing. JG Thirlwell is a Melbourne, Australia-born composer/producer/performer based in Brooklyn NY. After working with experimental group Nurse With Wound, Thirlwell started making his own records in 1980. He was inspired by the post-punk explosion of creativity in the UK which engendered the accessibility of DIY, as well as the writings of John Cage and systems music, among other things. Thirlwell's discography is extensive under many pseudonyms including Foetus, Steroid Maximus, Manorexia, Baby Zizanie, Wiseblood, Clint Ruin and others. If there is a common thread to his varied musical styles, it is dramatic intensity and evocative, cinematic quality. Thirlwell's oeuvre stretches the gamut from orchestrations, big band, cathartic noise-rock to abstract electronics and sound sculpture, chamber music, serial music and imaginary soundtracks - sometimes all in the same album. 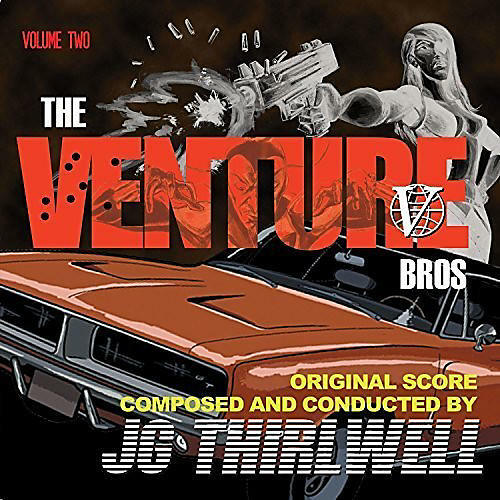 In addition, Thirlwell scores The Venture Brothers, a hit cartoon show on Adult Swim/Cartoon Network. Here we have the second volume of music from the series where once again Thirwell takes the listener on a cinematic roller coaster with thrilling results.